This week’s lecture at 5.30pm on Friday November 10th at the AIIT: Ursula Sims-Williams (British Library) ‘Investigating the library of Tipu Sultan of Mysore’. All welcome. Refreshments from 5pm. Tipu Sultan, ruler of Mysore from 1782 until his death at Seringapatam in 1799, remains one of the most charismatic figures of South Asian history. 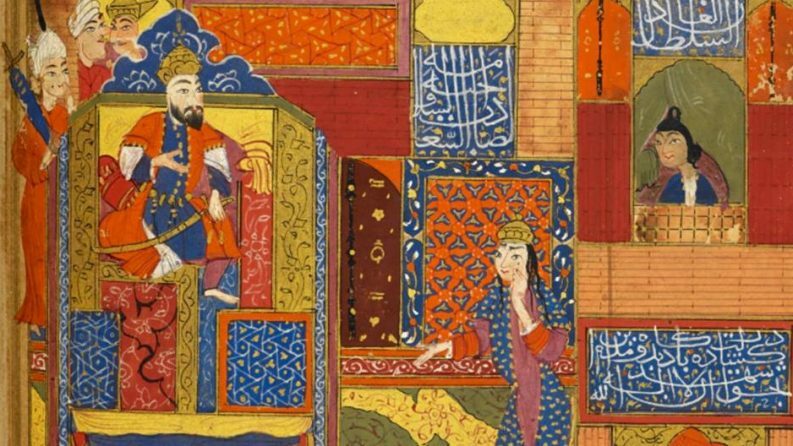 Simultaneously idolised and denigrated, this talk attempts a more nuanced interpretation by examining the contents of his library of which approximately 500 manuscripts form part of the Arabic and Persian collections at the British Library. Ursula Sims-Williams is Lead Curator of Persian at the British Library and a Trustee of the Ancient India and Iran Trust. Images (public domain): Portrait of Tipu Sultan, 1792, by an unnamed south Indian artist (F28); The story of Sindbad, 16th century (IO Islamic 3214).